Baseboard heaters radiate heat that warms the air in the room. Baseboard heaters warm the cold air that is lower to the floor which then rises. As the hot air rises, cold air is pushed to the floor where it is warmed by the baseboard heater. Baseboard heaters radiate heat that warms the air in the room. Baseboard heaters warm the cold air that is lower to the floor which then rises. As the hot air rises, cold air is pushed to the floor where it is warmed by the baseboard heater. This cycle continues until the room is heated to a desired temperature determined by a thermostat setting. Determine the square footage of the room. Measure the width and length of the room and multiple the two numbers to come up with the room's total square footage. 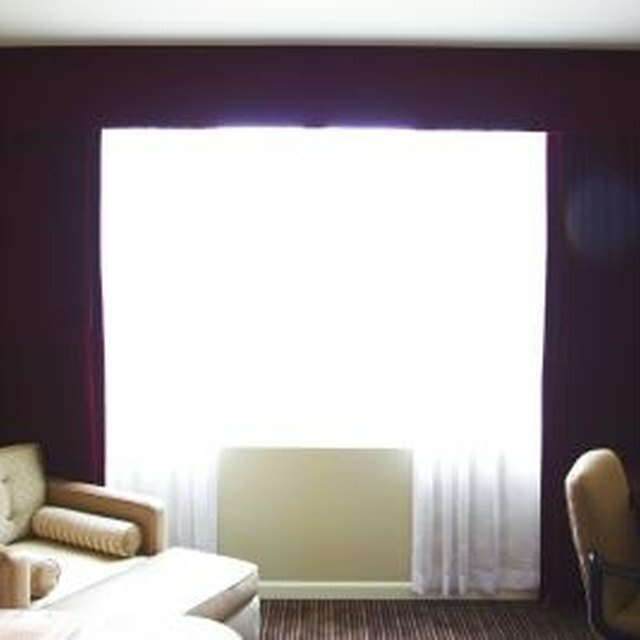 Determine the type of windows in the room (e.g., single- or double-pane). Count the number of exterior walls in the room. Exterior walls are those that face the outside. Find out if the exterior walls and space directly above and below the room have insulation. Determine if the room has any doors that open directly to the outside. Figure out how many watts of heat you will need. Standard density, six-foot baseboard heaters provide 1,500 watts of heat. Most rooms require 10 watts of heating per square foot of space. So, if you are trying to heat a 144-square-foot room (12-by-12 feet) you will need 1,440 watts of heat (10 times 144) you would need one standard density baseboard heater. The standard formula is 10 (watts of heat per square foot) times the total square footage of the room. Then divide the total square footage of the room by 1,500 to determine how many baseboard heaters you need per room. Increase the necessary watts of heat by 25 percent for the presence of each of the following: single-pane windows; one or more more exterior walls; uninsulated spaces/walls above or below; and a door that opens directly to the outside. For example, if the room requires 1,500 watts of heat but has single-pane windows and one exterior wall, you would increase the necessary watts of heat by 50 percent, or 750 watts, for a total requirement of 2,250 watts of heat. This increase is necessary because each of the four considerations listed above make the room less efficient at retaining heat. It's best to install heaters on an exterior wall below windows, which is where a room typically loses most of its heat. To improve the efficiency of the heater, be sure to seal any leaks around windows and doors to prevent heat loss. While determining the amount of baseboard heating is simple, installing it requires a high-level of expertise with electricity. Consider hiring a professional to install the heating if you are uncomfortable working with electricity or unsure of how to install the heating. Joseph King started his writing career in 1989. He has written feature articles covering industries from insurance and construction to natural products. He has been published in "Whole Foods Magazine," "Best's Review," "Retail Systems Reseller," "Nutraceuticals World," "Green Builder" and "Vitamin Retailer," among others. King earned a Bachelor of Arts in journalism from Rutgers University and a Master of Business Administration from St. Leo University. What Is a Tudor House? What Are the Dangers of Torchiere Lamps?